WooCommerce is a great E-Commerce system for WordPress. By default, WooCommerce comes with a number of useful pages to aid users/customers in the process of purchasing things from your site. However user registration or my account page may seems incomplete when your customers are growing and you can’t plan a promotional or marketing campaigns to your target customers because you can’t classify your customers into different groups. Whatever the idea is this article describes how you can add additional fields to the WooCommerce registration or My Account form. 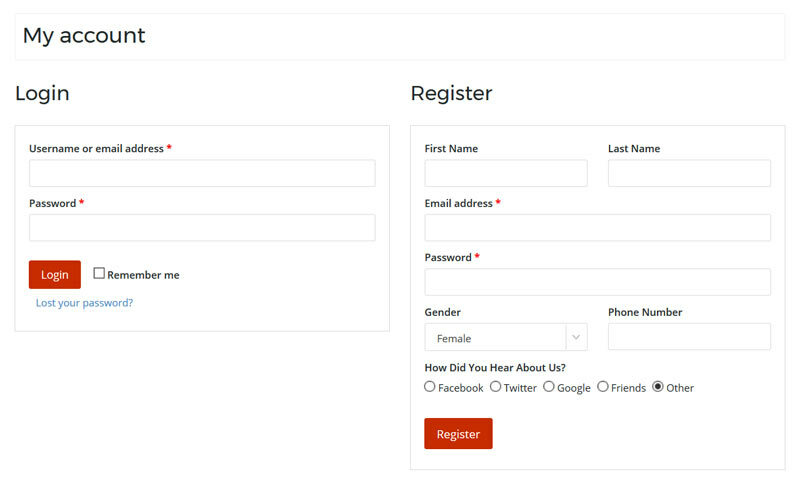 In order to see the registration form, the first thing we need to do is make a change on the “Accounts” settings page. Woocommerce has a callback/hook to display custom html before their registration form. All the codes below goes in function.php file of your active theme (or child theme). In this step we are going to validate the form fields.However, it is totally optional and depends on your business logic that what you want. If you don’t want to validate this then remove * from above code and skip this section. Now to administrator those custom fields you have use the following 2 hook. Once logged you can find these fields on the account details edit page. You can see the values from registration form already being populated. I hope you found this post helpful. Let me know in the comments if you’ve got any questions. Hey there! Nice tutorial, thanks for sharing! I’d like to know if there is a way to see all this data from the backoffice once the new client is registered. I would like to know also how one can see these fields in WP user backend screen. Great tutorial. Worked like a charm. I too would like to know how to populate these fields in the WP user backend? Thanks for this tutorial. Everything works perfectly. However, as an admin I cannot see these fields anywhere in the backend with user details. What can I do to see these fields? Also, these fields are not available when a user registers directly during checkout process. How can I make that change? Hi! Thanks for this tutorial. Is there any way to send all those user data to admin after form submit? Can this method be used to save Shipping & Billing Address?